Remember when the future was hopeful? The original “Star Trek” series offered us a vision of a time when Americans and Russians could work together, where things were clean and orderly and all sorts of different people – non-humans, even! – came together to do great things. Somewhere along the line, though, the future became less “Jetsons” and more “The Matrix” – a cool-looking place, still, but all black leather and vinyl and dystopia. We no longer think of the future as a great place we’re heading to. Cynicism and pessimism are the order of the day. 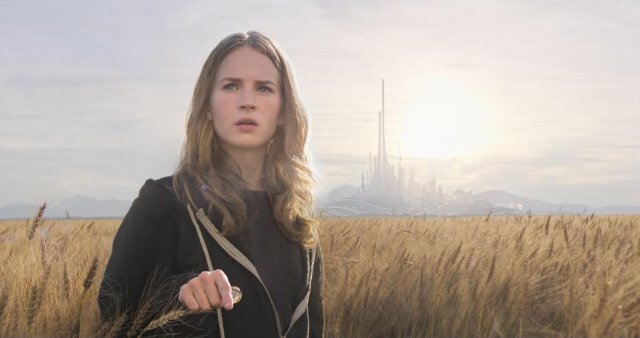 “Tomorrowland” is a kids film that makes an effort to engage adults as well. Unfortunately, it seems like you have to already be the optimistic type to enjoy the story, and that means the movie is preaching to the converted rather than bringing new optimists to the fold. If you aren’t able to look at its vision of the future, a clean and white and gleaming city of hope, and think, “wow, that’s awesome” instead of “ok, so where did the funding come for them to build this? Construction isn’t free,” you’ll likely write the whole thing off as twee rather than being drawn into the idea that the future can be wonderful if we get up off our couches and make an effort. Our protagonist, Casey, is a teenager obsessed with science and engineering. When she receives a small pin that lets her see into another world, a gleaming vision of the future, she becomes obsessed with finding out how to get there. She eventually teams up with Frank Walker (George Clooney), a cynical scientist who lived there once, but not anymore. There are forces trying to stop them from making their way to the utopia the pin shows, so there are some thrills and chills as evil robots come after them. This isn’t a particularly deep film – the characters are all fairly simple, their functions in the story clear and obvious. But then again, this is ultimately a movie for kids, and kids may well like it just fine if they haven’t already been totally absorbed by the dystopic futures currently so popular in young adult media. Certainly “Tomorrowland” offers a nice break from the unrelenting darkness so many future-oriented stories have these days. The special effects, acting, and cinematography are all solid – what really defines whether you’ll like “Tomorrowland” or not is whether you can suspend your disbelief enough to buy into its story of hope and optimism. For some, this will be a fun, exciting film. For others, a story at once nostalgic and reinvigorating. For a great many others, however, it’ll just fall really, really flat.